Atomic Cantina was very proud to open our doors on May 5, 2003. It is a neighborhood bar located in the heart of downtown Albuquerque New Mexico. The atmosphere of Atomic is very laid back, all are welcome as there is not a dress code or cover charge. They are the feel good neighborhood bar of downtown ‘burque with a friendly staff willing to provide prompt, quality service. They host live music in the punk / rock / indie / rockabilly vein 3-4 nights a week, host a great Karaoke evening on Wednesdays and an underground Dub Step / Drum & Bass / Electronic dance evening on Thursdays. Also catch their swing dance / rockabilly evening “Greaser Round-up” every other Saturday night. Atomic Cantina is located on Gold Street between 3rd and 4th streets in downtown Albuquerque. Their jukebox is stocked with your favorite punk, indie, and rock CD’s and there is a pool table and video games for your entertainment. Listed below is a schedule of what they currently have going on at Atomic along with information for any bands interested in performing. Also refer to the event calendar link for specifics on daily events at Atomic. Atomic Chill Night starts at 8pm – Free Jukebox Sunday evenings at Atomic. Occasional Rock shows on Sundays beginning at 9pm. Rock, Metal and Punk shows Monday evenings at Atomic Cantina. Check out some of the best Punk and Rock the city has to offer. Post Burial w/ DJ Evan — Goth, Post-Punk, 80’s New Wave, Alternative Evening. Great drink specials. Baby Ketten Karaoke hosted by Issac & Nate Wednesdays beginning at 9pm. $3 Marble Brewery Red and IPA Drafts all night. Atomic DJ evening. Catch Atomic Bass Takeover two Thursdays a month featuring the best in Drum & Bass and DubStep. Other Thursdays Feature Electronic acts such as Laconic and DJ’s sponsored by Red Fish Entertainment. Starts at 9:00pm. Atomic hosts the best local original rock acts with occasional national acts performing as well. See why the ‘burque scene is getting known as one of the best in the country. No Cover makes it a no-risk venture for you. Atomic hosts the best local original rock acts, occasional national acts as well. Every other Saturday Atomic Hosts a great Rockabilly Swing Night called “Greaser Roundup”. On other Saturdays catch the best local / regional original Rock acts. 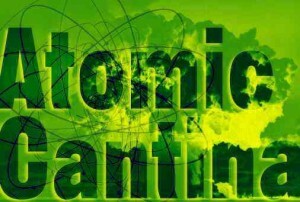 Atomic Cantina hosts original music in the alternative / indie / punk / rockabilly vein. Their stage is 10ft x 18ft. They have a house sound person; provide the PA system, 12 channel board, 2 monitors, mics and stands. Atomic Cantina has a 5 piece drum kit and bass cab available for bands to utilize if needed. If bands choose to do so, they must provide their own cymbals and bass head. All band members / crew must be 21+ w/ valid (non-expired) photo id, no exceptions. This entry was posted on Wednesday, November 20th, 2013 at 3:06 am	and is filed under Bars. You can follow any responses to this entry through the RSS 2.0 feed. You can leave a response, or trackback from your own site.